Three separate stories describe the adventures of a six-year-old boy in West Virginia in the 1950s. No Soap: Little Ned and Mr. Jenkins scour the West Virginia countryside in Mr. Jenkins' truck looking for the “Man with the Money.” They go to the blacksmith, to the sawmill, to the brickyard, to the movie house, to the general store—and (okay, here's a secret) they find the “Man with the Money,” but not before Little Ned finds something special: a brand new nickname. The Boy Who Hated Halloween: Little Ned goes to a Halloween party in a strange town with Caspar the Ghost, Snow White, Pocahontas, Frankenstein, and other monsters and gets the surprise of his life! The Ocean Vacation: Little Ned loves his nightly bath, loves the water, and wants to swim in the ocean, but not with spiders, snakes, and goopy, slimy things. Well, boys and girls, and grownups, too, find out how Little Ned—with a little help from Mother and Daddy—overcomes his fear of the big blue endless ocean and learns how to swim. Three superb stories with clear, simple sentences make this charming easy-reader an ideal stepping-stone to chapter books. 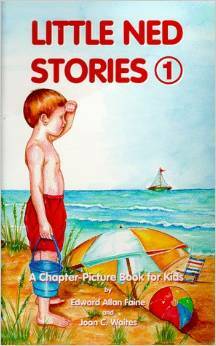 The warm, nostalgic illustrations and large, bold font appeal to early schoolers, while the realistic stories fascinate many a second grader.